It is really, really hard to support the New York Yankees. Laugh all you want. The fact of the matter is we haven’t won a World Series since 2009. By my calculations, it’s been exactly 643 days since Shane Victorino grounded out to Robinson Cano in Game 6, triggering celebrations across New York. To put that in perspective, Gandhi’s longest hunger strike was only 21 days. By that measure, Yankee fandom is 30 times worse than being oppressed by the British. And counting. And we’ve had our fair share of tragedy. Consider this: Every single member of the 1927 Yankees team — maybe the best collection of baseball players in history — is now dead. I think I’ve made my point. But as much suffering as Yankee Nation has endured throughout our troubled history, nothing has ever been worse (for anyone, ever) than this past weekend. With the American League East lead at stake, we blew a golden opportunity against the Boston Red Sox, an organization that played possum between 1918 and 2004 to stoke the country’s sympathy. After losing Saturday and Sunday, the Yanks now trail by one game as the season enters the final turn. In other words, we’re finished. It was all I could do to even wake up this morning. But now that I’m here, I think it’s important that we come together and face this head-on. What went wrong? Whom can we blame? Is there any chance to meet with Bud Selig and get the whole thing reversed? How long until America becomes a true banana republic and the Yankees can literally buy championships? If the letters become jumbled on the screen, it’s because I was crying and couldn’t see through my tears. Here then, without further delay, are five reasons why the series was lost. Suddenly, after years of success, Sabathia can’t pitch against Boston. After Friday’s excellent win, the Yanks were set up perfectly to take the series. CC, a Cy Young contender, only needed to beat John Lackey, a guy who had fought valiantly over the past month to reduce his ERA from 7.47 to 6.23. But Sabathia laid another egg. It was the perfect chance to take the division lead — and he blew it. I hate to drop this bomb, but I’m left with no other choice: CC Sabathia is not a true Yankee. If I were New York manager Joe Girardi, I’d put him on waivers and make sure he ended up in Houston. That would teach the rest of the team an important motivational lesson: We won’t support you unless you’re perfect. Cano went 1-12 in the series with six groundouts. He’s batting .227 against Boston in 12 games this season, and it would appear that our rivals have found a formula to bottle him up. It’s not complicated, and it’s based on the premise that Cano will almost never walk. If your pitchers are good enough, and you throw enough junk down and away, he’ll eventually reach out and pull a weak grounder to the right. Maybe that’s why his lifetime .307/.346/.491 line dips to .248/.296/.461 in the postseason, when the pressure is greater and the pitching is stronger. His difficulties in October have been overshadowed by the annual disappearing acts of guys like Mark Teixeira and Nick Swisher, but his troubles are real. The solution? Girardi should send him down to the Yankees’ Double-A affiliate in Trenton, N.J., to work as a bat boy for three weeks. Public humiliation is the only answer. Nunez bailed out, charging hard and leaving the bag unattended. Mariano was forced to get the out at first, and one batter later Dustin Pedroia tied the game. You can’t do that, Eduardo! Don’t you know Mariano is a cat on the mound? He’s literally part feline. I had the good fortune to meet him one time, and I had an allergic reaction after shaking his hand. He’s been killed six times so far, but he still has three lives. When he’s not pitching, he likes to spend time at home scratching a wooden pole. If Nunez is covering, Mariano gets the out and the Yankees go on to win. I’m convinced. The Yankees need to start a Class-A affiliate in Siberia so they can send Nunez there for six years. This man is the face of evil. He is the worst living person in the world. 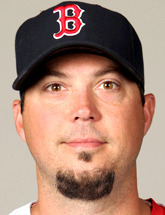 True facts about Josh Beckett: This one time, the Red Sox tried to make a Beckett bobblehead figurine, but it had to be discontinued because it made children cry. The workers who produced the bobbleheads later filed a class-action lawsuit against the team because it gave them night terrors. Of the 150 horror movies currently in production worldwide, 82 of them have Josh Beckett’s bobblehead as the main character. And he’s killing the Yankees this year. The Sox have won all four games he’s started. Losing to the Red Sox is bad enough, but losing to Josh Beckett is like losing at ping-pong to your worst enemy, if you worst enemy was Josh Beckett and the ping-pong match was actually a pistol duel. Does that make sense? Let’s go back to Sunday night. It’s now the 10th inning. All the momentum is with Boston. The Yankees go down in order in the top half of the inning. The situation could not be more pressure-packed, and who does Girardi bring in? Phil Hughes. Phil. Hughes. The same guy who was so bad in three starts at the beginning of the season that the Yanks put him on the DL with “dead arm.” The same guy who then missed almost three months before he was ready to pitch in the big leagues again. The same guy who had shown some slow improvement, but who still had to be nurtured along if the team had any hopes of using him effectively in the playoffs. His last start was his best yet, a six-inning gem against the Chicago White Sox. So why, after massaging his confidence so long, after building him back up into a major league pitcher, would you possibly throw this guy into the pressure cooker in the 10th inning in Boston? Why would you ever do that? We know the result. Ortiz doubled, Reddick singled, game over. And now Hughes’ confidence is probably shattered. Maybe he’ll recover. Maybe he’ll even recover immediately. But watching him get thrown to the wolves Sunday night was the worst part of a bad weekend. It was enough to make me think that Girardi, like Sabathia, Cano, and Nunez, needed to be sacked. Sure, the Yankees will still make the playoffs. And yes, a disappointing game in August has little bearing on what ultimately happens to this team. But let’s cut through the facts and be honest with ourselves: The season’s over. We’re done. And so am I. I refuse to root for a team that continually lets me down. If we win a World Series this year, maybe I’ll be back. Maybe. Otherwise, I’m waiting for the banana republic. Shane Ryan is a staff writer for Grantland. He writes Grantland’s nightly roundups for The Triangle. Follow Shane Ryan on Twitter @TobaccoRdBlues.